Inflammatory pseudotumor is a quasineoplastic lesion consisting of inflammatory cells mixed with myofibroblastic spindle cells and few normal plasma cells and occasional Russell bodies. It most commonly involves lung and orbit; as such any soft tissue of the body can be involved. A few cases of salivary gland involvement have also been reported. , The temporal bone, skull base, and facial nerve are very rarely involved. Review of the literature revealed only 35 previous case reports of inflammatory pseudotumor affecting the skull base and temporal bone area. Middle ear and mastoid involvement was first reported by Benton, et al. in 1992. Only 20 cases of middle ear and mastoid involvement have been reported in a meta-analysis by Ajibade, et al. ; but involvement of mastoid sparing middle ear is very rare, only two such cases have been reported previously in available English literature, one by Nam, et al. in 1994 and another by Ajibade, et al. in 2010. This is the first case reported from Indian subcontinent. C.D, a 29 year female presented with dull ache in left ear since last 6 months. No history of otorrhea but there was loss of hearing in left ear. She was treated by several general physicians and ENT specialists with different antibiotics and non-steroidal anti-inflammatory drugs without any sign of improvement. On examination, general survey was normal. Tympanic membranes of both the ears were intact and normal. Pure-tone audiometry revealed profound sensori-neural hearing loss. Tympanometry showed normal middle ear pressure and compliance. Electronystagmography showed that there was no response to hot or cold stimulation of left ear. 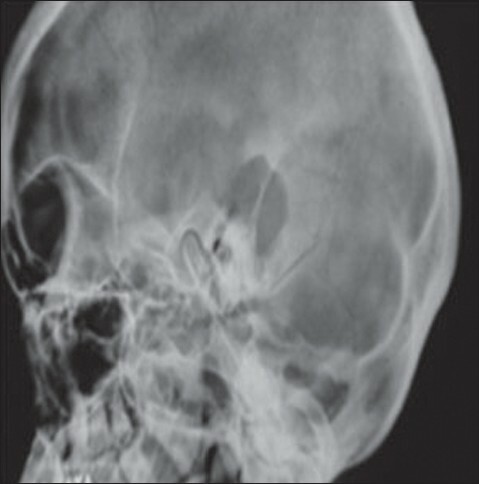 X-ray mastoids (Lateral-oblique view) showed [Figure 1] radiolucent lytic shadow in the left mastoid region. Contrast enhanced computer tomography scan of temporal bone showed [Figure 2] and [Figure 3] mildly enhancing extra-cranial soft tissue density mass within left mastoid and base of petrous bone which is eroded with adjoining soft tissue extension. External auditory canal and middle ear were normal. There was no extension in brain in MRI. Our provisional diagnosis was granulomatous disease at mastoid region. Exploration of left mastoid was done under general anesthesia through the post-aural route. Greyish friable granular mass was removed without significant bleed. Extensive bone destruction and exposure of dura was noted. Labyrinth was also destroyed but tympanic membrane and ossicular chain was found to be intact. Intact-bridge canal-wall-down (CWD) mastoidectomy (Open Cavity) with preservation of middle ear and wide conchomeatoplasty was done. The post-operative period was uneventful. The histopathological examination(HPE) report showed an uncapsulated lesion composed of fibrous tissue proliferation, stromal hemorrhage, and a polymorphic cell infiltrate of mature plasma cells, lymphocytes, and neutrophils. No glandular elements were noted. Histopathologically, it was diagnosed as inflammatory pseudotumor [Figure 4] Plasma cells were immunoreactive to kappa and lambda light chains suggesting the polyclonal nature of the lesion. The patient was followed up for 3 years. 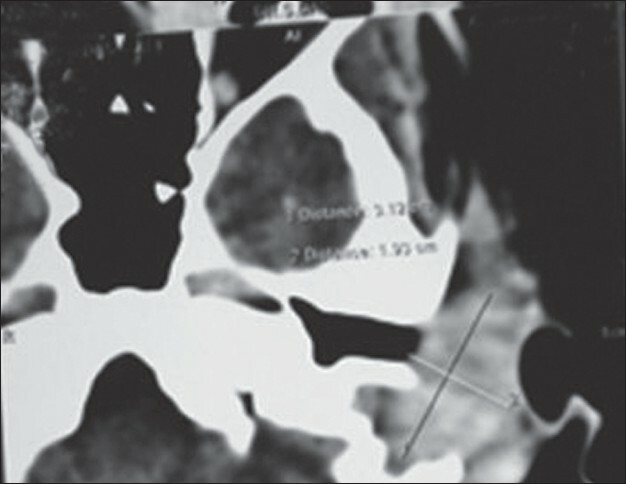 No recurrence of disease was noted and mastoid cavity was found to be well epithelialized. Inflammatory pseudotumor is a tumor-like lesion of unknown etiology. The term "inflammatory pseudotumor" has been used to describe a wide range of reactive and neoplastic lesions, including inflammatory myofibroblastic tumor, pseudo-sarcomatous myofibroblastic proliferations of the genitourinary tract, infectious and reparative processes, and inflammatory pseudotumors of lymph node, spleen, and orbit. Common symptoms of inflammatory pseudotumor depend on the site of involvement. In the ear, the patient usually presents with total deafness (as in our case) of the affected side. Caloric test may be negative due to vestibular involvement however patient may not experience any vestibular symptom due to central compensation. Treatment options include wide surgical excision. Radiotherapy and steroids can also be considered. We have done CWD mastoidectomy in our case for total disease clearance and to obtain a final histological diagnosis. In the previously reported cases involving the mastoid, Nam, et al. treated the patient by CWD mastoidectomy with radiotherapy while Ajibade, et al. treated the patient by Canal-wall-up mastoidectomy with post-operative steroid and radiotherapy. Recurrence of inflammatory pseudotumor depends on its anatomical location. In lung it is less than 2% but in extrapulmonary sites it is about 25%. In the ear, recurrence and prognosis depends on the site of involvement and its surgical clearance. We have not noticed any recurrence in our patient in 3 year follow up period following surgery alone, without steroids and radiotherapy treatment. It showed that surgery alone, if done properly to remove all the disease, is the sufficient treatment. Inflammatory pseudotumor has intermediate biological potential due to a tendency for local recurrence and a small risk of distant metastasis (< 5%). In the ear, no clear judgment of its prognosis can be given because of its rarity. Written informed consent for publication of study was obtained from the patient after surgery. Inflammatory pseudotumor of mastoid region is a very rare disease. 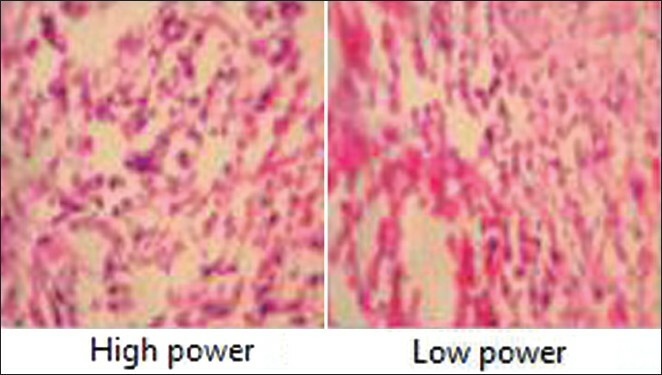 Clinical suspicion is the important guiding force for diagnosis. In case of dead ear with intact middle ear and lytic lesion in mastoid region, inflammatory pseudotumor should be thought of. For proper diagnosis CT scan, MRI and HPE are essential tools. Surgery is the mainstay of treatment, though radiotherapy can be considered in inoperable or debilitating cases. Steroids may have some role by keeping inflammatory process under control. The authors wish to acknowledge with gratitude the logistical facilities extended by the Director, IPGME and R/SSKM Hospital, Kolkata, and Head, Department of ENT of the same institute, in the management of this patient. 1. Williams SB, Foss RD, Ellis GJ. Inflammatory pseudotumors of the major salivary glands: Clinicopathologic and immunohistochemical analysis of six cases. Am J Surg Pathol 1992;16:896-902. 2. Mathews J, Nicol A, Dingle AF. Inflammatory pseudotumor in the submandibular region. J Laryngol Otol 2001;115:502-3. 3. Benton NC, Korol HW, Symth LT Jr. Plasma cell granuloma of the middle ear and mastoid: Case report. Ann Otol Rhinol Laryngol 1992;101:92-4. 4. Ajibade DV, Tanaka IK, Paghdal KV, Mirani N, Lee HJ, Jyung RW. Inflammatory pseudotumor (plasma cell granuloma) of the temporal bone. Ear Nose Throat J 2010;89:E1. 5. Mulder JJ, Cremer WR, Joosten F, Wirsrma A, van den Broek P. Fibroinflammatory pseudotumor of the ear. A locally destructive benign lesion. 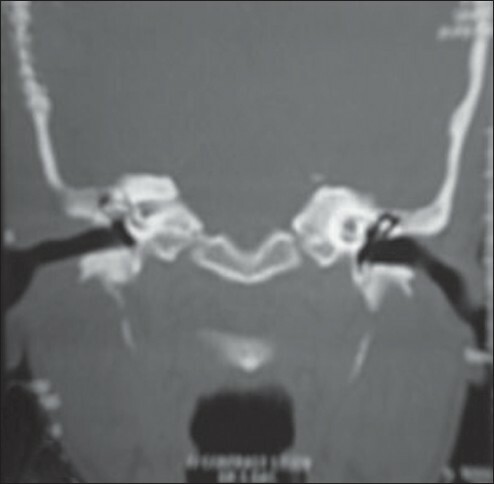 Arch Otolaryngol Head Neck Surg1995;121:930-3. 6. Janik JS, Janik JP, Lovell MA, Hendrickson RJ, Bensard DD, Greffe BS. Recurrent inflammatory pseudotumors in children. J Pediatr Surg 2003;38:1491-5. 7. Meis JM, Enzinger FM. Inflammatory fibrosarcoma of the mesentery and retroperitonium. A tumor closely simulating inflammatory pseudotumor. Am J Surg Pathol 1991;15:1146-56. 8. Coffin CM, Watterson J, Priest JR, Dehner LP. Extrapulmonary inflammatory myofibroblastic tumor (inflammatory pseudotumor). A clinicopathologic and immunohistochemical study of 84 cases. Am J Surg Pathol 1995;19:859-72. 9. Coffin CM, Fletcher JA. Inflammatory myofibroblastic tumour. In: Fletcher CD, Unni KK, Mertens F, editors. World Health Organization Classification of Tumours. Pathology and Genetics of Tumours of Soft Tissue and Bone. Lyon: IARC Press; 2002. p. 91-3.